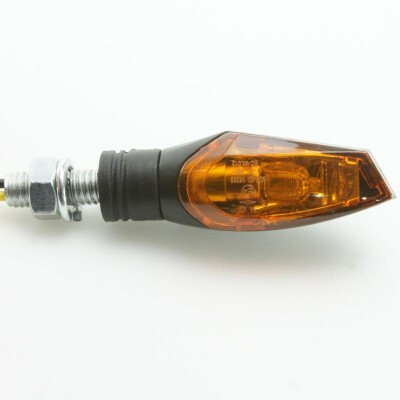 STALK INDIATOR E4 Marked Mega-bright, easily replaceable, 6W Halogen bulb. Just remove a single small screw and the whole lens assembly slides off. M8 mounting thread 19mm long with nut and locking washer. Rubber mount at thread end. Overall length including thread 78mm. Width and depth 21mm. 300mm long flyleads with bullet terminals. WIRING: BLACK (Earth -12V). YELLOW: (Indicator Live +12V). M10 x 1.25 mounting thread. 12V/10W bulb included. 108mm x 47mm x 53mm. M10 x 1.25 mounting thread. 12V/10W bulb included. 102mm x 47mm x 60mm. 100mm x 40mm x 35mm. 12V/21W M8 mounting thread. 100mm x 40mm x 35mm. 12V/21W M8 mounting thread. 90mm x 30mm x 42mm. M8 Mounting Thread. 90mm x 30mm x 42mm. M10 x 1.25 mounting thread. 12V/10W. 95mm x 45mm x 48. M10 x 1.25 mounting thread. 12V/10W. 95mm x 45mm x 48. 'E9' Marked. Lens size only 26mm x 29mm x 17mm. 17mm front to back Fix through a single 6mm hole. Size only 55mm x 26mm x 21mm not including the M8 x 18mm fixing stud.